Every time I look at it, the lyric “One of these things is not like the others” pops right into my head. They have all made these beautiful traditional style houses and here I come with big old mushroom. I started to not bring it to the bee organizer because it is so different from the others in both color and style. I took it anyway, ready to have her give it back. She was beyond gracious and thankful. I even gave her an out to not keep it, and she held on to it. Phew! First I need to draw the pattern. I absolutely love this site: Free Online Graph Paper. There are generators for all kinds of graph patterns and you can control the size of the grids on all of them. In this case, I wanted a 12″x12″ grid broken into 1″ squares. As a bonus, I had it add in some extra fine lines at 1/2″ to help round out the corners. Obviously, I’m not going to get a 12×12 grid with 1 inch squares from my inkjet so I printed one with .5″ squares for planning and several pages of the 1″ squares. A little tape and scissor action and I have exactly what I need. 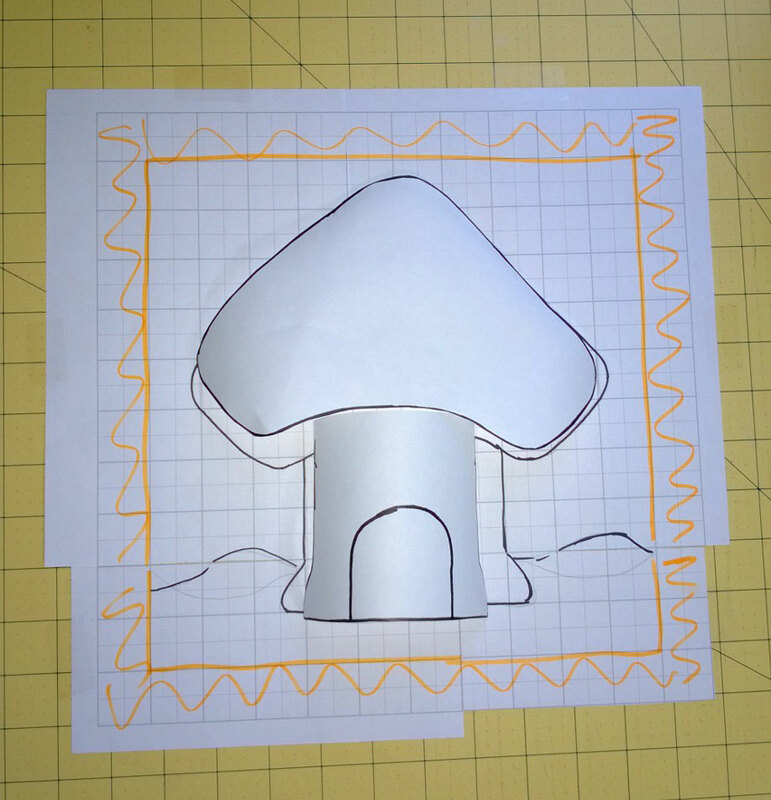 Now I just draw my mushroom on the bigger grid and trace out the house and roof pieces on some fusible web. I thought it would be extra neat to make the door and window have a “glow” effect as if there were lights on inside. To that end, I got a little creative with my fabric layering. I always try to work from the middle out whenever I can, so I hooped it with room to reach the center window and door. I realize I have a lot to say about hooping! Look for it in a future post. Now it is ready to embroider. There’s a million ways I could do this, but I’m hyper focused on practicing a thick zig zag border type stitch. I think this is something that has potential and with enough practice, I can make the lines nice and smooth with consistent stitching. After finishing the window, curve of the door and creating a new line across the bottom of the door, I can uphoop the project and cut as much of the extra layers of fabric out as possible. In this case – I cut the white cotton and bottom layer of tulle as close to the door and window stitching as possible. You can’t quite see the light effect yet for the remaining layer of super solvy and tulle, but it is starting to take shape. Now it is back to the zig zag until I make it all the way around the house. All done! Now I get to remove the super solvy and cut out that last layer of tulle, yay! lights! The top of the house goes on the same way, but it’s fabric sandwich is much smaller – no tulle, no white cotton. Once the mushroom top was on, all that was left was adding a few borders and calling it done! I did edit myself a TON on this one. I think it looks a little plain (could use some fabric changes or other appliques), but plain is good for the whole project. I hope to make it to the bee this month and I hope the rest of the bee is as accepting as Ginny and likes it, even if it is non-traditional. I think it’s pretty cute for sure! Linking up with Freshy Pieced! 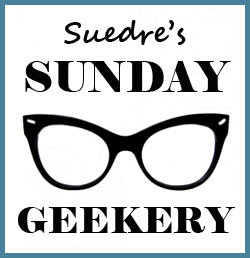 Linking up with Fiber Artist Journey! Linking up with Free Motion Quilting Project! Had not even thought about the smurfs! It was actually inspired by a gift from a photoshopper. She had made a scene around a mushroom house. That’s where the editing came in – I wanted to add all the little extras she did. Your mushroom house if very cute! I much prefer neighborhoods where there is a little eccentricity! There’s plenty of eccentricity here, maybe even a little kitch. :)Thanks for stopping by! Perfect house quilt! I like tulle idea also. I love that grass fabric. The grass was a random fabric.com purchase I made (needed $5 for free shipping). It does work pretty well in this project. What a cute house what’s not to love!! You’re right – I shouldn’t be so hard on myself! Thanks for stopping by, do come back! Eaack! So adorable! I really looks like they left the light on! I looooove it! It turned out so cute! I’m glad they liked it! Thanks Renee! Me too! I was so unsure about it! Thanks for stopping by, do come back by – I’ve got a few things in the hopper I can’t wait to share! Very cool technique to light up the house with tulle. This will be such a fun addition to a quilt of traditional house blocks! Thank you! I’ve used the tulle trick once before on an Addams Family trick or treat bag. In that case, I even used LED light behind the tulle to really create the effect. I’ll be posting about it in the future, but sure come back and visit me!